Each long-range bomber can carry only two of these cruise missiles, each of which weighs about six tons. New warheads will be capable of overcoming enemy air defense systems and intercepting fighters in the stratosphere at an altitude of up to 130,000 feet. According to military experts, the new weapon will not be put into operational use and will be used only as a deterrent. 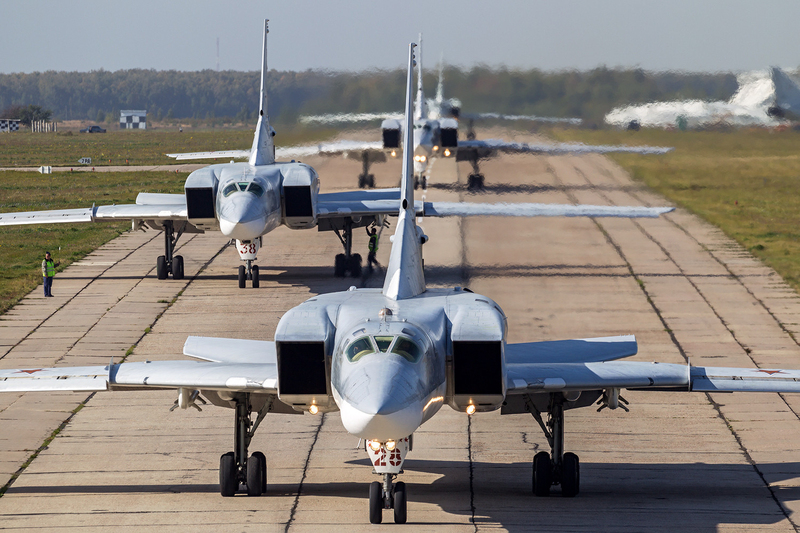 Russian designers are carrying out final tests of the newest Kh-32 cruise missiles for the Tu-22M3 long-range bombers involved in the Syrian operation. The new weapon will be able to rise into the stratosphere to a height of up of 130,000 feet, with a nuclear or conventional 500-kilogram (1,102 lb) warhead and hit targets within a few yards. As Igor Korotchenko, editor-in-chief of the Natsionalnaya Oborona (National Defense) magazine, told RBTH, the Kh-32 is perfect for attacking the enemy's carrier strike groups and large ships. "However, the weapon will not be used in the operations of the domestic Aerospace Forces abroad and will serve only as a deterrent as part of the Russian Federation's military doctrine," he said. The missile is equipped with an inertial navigation system (an autonomous system not affected by electronic warfare) and heat-seeking warheads with a radar homing head. This solution will greatly improve the accuracy of its guidance, making it independent of GPS/Glonass navigation satellite systems. Unlike other missiles, the Kh-32 rises into the stratosphere to the height of aerospace probes, where there are no potential adversary fighters or missiles. Then it flies a distance of up to 1,000 kilometers (620 miles) before swooping down on a target. According to an RBTH source in the defense industry, no Russian or foreign missile defense system today is able to detect the Kh-32 approaching the target: neither the domestic S-400 Triumph system nor the American MIM-104 Patriot. "The airspeed of the Kh-32 is five times higher than its predecessor, which has been deployed since the late 1960s," the source said. "Air and missile defense systems today cannot detect a diving warhead, which moves down at a speed of over 5,400 km/h." According to the source, the Kh-32 does not violate the provisions of the Outer Space Treaty of 1967 as it is not launched into orbit. It also does not violate the provisions of the Intermediate-Range Nuclear Forces Treaty – the agreement does not prohibit either Russia or the United States from developing air-to-surface missiles, the RBTH source explained. The Kh-32, which is comparable with a front-line fighter aircraft in size, is an upgrade of a missile from the late 1960s. Its predecessor could also be fitted with a 500-kg nuclear or conventional warhead. However, its operational range was only 90 kilometers (55 miles), and its accuracy left much to be desired. But today, designers have created a new engine, which allows the missile to hit targets at a distance of up to 1,000 kilometers, and a new control system, which coordinates with other munitions fired in a volley.